We’ll admit, we’re suckers for a good fantasy story. After you’ve gone through a long day of complicated real-life dealings, it’s nice to escape to a world where the good guys are good, the bad guys are bad, and you’re distracted with knights, magic and various exotic beasts well enough to suspend your disbelief that such a place could possibly exist. 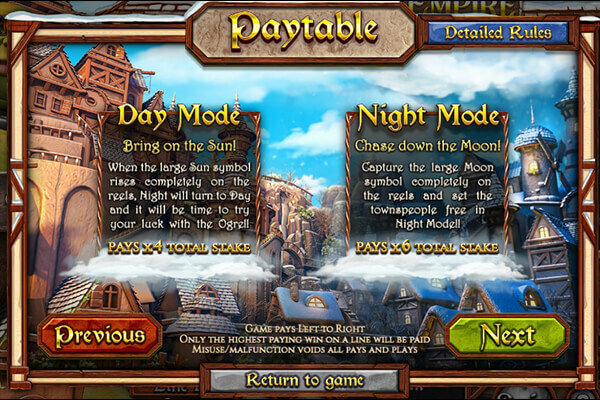 Ogre Empire slot, a take off on the popular Shrek sequel, look pretty cool and especially like the transition between the day and night cycle. 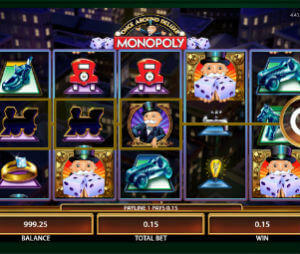 The newly launched slot takes place on a 5×3 playing field and has several special features to entice players into spending more time with the game. During the day, you have blooming Wilds, and ogre smashes, which means that the ogre will break stone symbols. During night time, several unique symbols appear, and you have a different flavor of blooming Wilds as well. You can check our full review below, but we will jump ahead and say that the bad part of Ogre Empire is the RTP, which sits at 95.22%. That might be ok for landbased casino behemoths such as IGT or WMS, but for online slots provider that’s just too low. There are BetSoft slots with RTP almost 3% higher, like At the Copa and Good Girl Bad Girl slots. Changing gameplay depending on the time of day – This is something we quite enjoyed, and it presents a fun duality that allows for feature diversity without overwhelming players. During night time, you have higher paying symbols out that replace some generic ones, but you only have one feature active, as a result. Meanwhile, over the day, on top of the blooming Wilds, you also have access to the ogre smashing stone blocks, meaning both day and night have something different. Gamble – If spinning reels alone isn’t enough to strike your fancy, you also have the option of trying to double up on your win. You can either bet all your winnings or just half of them, and you do so by calling out the coin toss. Awesome theme – There’s something just funny to sit back and see that giant ogre sitting on a throne of houses where the city was built. The game really breathes in an atmosphere – the way he’ll angrily swing his club, or how he falls asleep during the night cycle. Even the title looks like the ogre began to infect it halfway through. Unknown volatility – While we can make an educated guess depending on how much we’ve played it, the fact this information isn’t readily available is a slight cause for concern. Players who don’t have a lot of cash don’t want to sink their time into high volatility games, for example, while high rollers likely won’t get the thrill they’re after from low variance titles either. You have a few bonuses to look forward to in Ogre Empire. When a full reel day or night symbol appears on the third reel, the time of day switches, and with it, the bonuses you have available to you. During daytime, you have access to the Ogre Smash, which destroys all stone symbols in a fit of anger, allowing new icons to fall into place. Both during daytime and night-time, you have access to Wild flower blooming, which creates three additional Wilds. During night-time, stone symbols are replaced with the King, Queen and Joker, which pay a whole lot more than they usually do. We’ve quite grown to fancy this Betsoft release, we have to admit. The ogre may not move around a lot, but he’s very helpful with that club of his in a pinch, and both visuals and gameplay were rather enjoyable. The only thing we can complain about is the absence of information regarding the game’s volatility.